Tattletale annunciators and magnetic switches are the nerve centers that translate Swichgage® contact operations into decisions and operate the alarm or shutdown device. 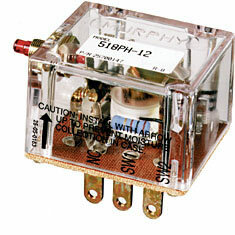 These switches are the electrical load carrying devices for the alarm or shutdown device. Tattletale annunciators indicate which monitored function failed leading to the alarm or shutdown magnetic switches do not. 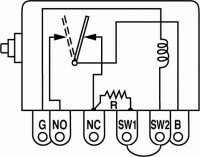 Magnetic switches operate basically as a latching relay. Magnetic switches and Tattletale annunciators are available for use with engines or electric motors. Various circuits, time delays and contact configurations are available to match the power source and mode of operation required for alarm only, alarm before shutdown or shutdown only. For distributor ignition engines, the magnetic switch opens the distributor coil circuit to cause shutdown. 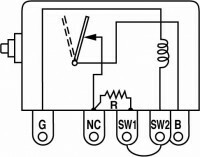 For magneto or CD ignitions the magnetic switch grounds the ignition output. 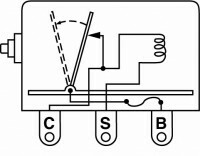 Some models can also trip fuel valves instead of or in addition to grounding the ignition. Diesel engines are shut down by either closing off the fuel or air supply. Magnetic switches and Tattletale annunciators can make or break circuits for these engines. For electric motor application, various magnetic switches are available to operate the motor starter, holding coil directly or in conjunction with appropriate Murphy Transformer-Relay assembly. Magnetic switches and Tattletale annunciators described in this bulletin are electrically tripped relay type devices. Models are available to operate from battery power, 120 VAC, conventional magnetos and capacitor discharge type ignitions. Energized to run models allow Closed Loop circuitry. Others draw momentary power to trip. Configurations are available for contact make or contact break to cause shutdown. Some models have both make and break contacts. All models have a weather-resistant case with screw terminals for ease of customer hookup. Manually reset models have a face mounted reset push button which also serves as a fault indicator in the Tattletale version. In this application, one or more Tattletale/magnetic switches are used to advise operating personnel which monitored function caused shutdown. Only the Tattletale connected to that function sensor trips causing the reset push button to pop out. Electrically reset models perform the same functions as the manually reset models and are reset by cycling the power supply off and then on. Time delay models use reliable solid state time circuitsto lockout operated switch contacts for start-up and/or to allow operation of alarms before shutdown occurs. 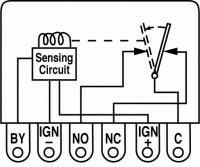 Specific models allow application of power to a shutdown circuit and automatic disconnect of power after a given time delay.